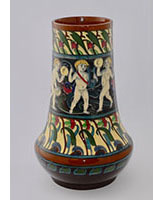 Sold by on Ebay this week for Cancer Research UK,was this wonderful Walter Slater dual handled vase. 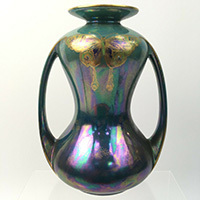 The description read "Shelley 'Walter Slater' tall decorative vase. This colourful display piece features an attractive butterfly design with a pearlised metallic finish and gold detailing. Signed 'Walter Slater' to the base. 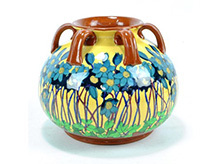 The vase has large open handles to each side and is approximately 10.9" tall. The vase has some light signs of wear, mainly with a few minor blemishes to the glaze coating, but is otherwise in good used condition." This item was hotly contested by eleven bidders who placed twenty eight bids between them. The lucky bidder who crept in just eight seconds before the end of the auction, secured the vase for £148.00. It's not often that crested ware features in Noteworthy Lots but this piece on Ebay caught our eye and several bidders also. 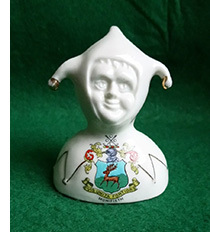 Simply described as a "Shelley crested china jester for Monifieth, and backstamped "Late Foley, Shelley, England" measuring 3.5 inches (9cm) in height, 2.5 inches (6cm) in length and 2 inches (5cm) in width. In very good condition". Six bidders competed for this piece placing eight bids between them with the winning bid finally reaching £310.52. 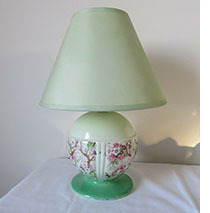 This table lamp again in the Maytime pattern has just sold on Ebay. Described as "A superb Shelley 'Art Deco' table lamp in the sought after 'Maytime' pattern, the lamp base has the green SHELLEY ENGLAND backstamp (1912 - 1925) inside, with 8787 9 hand painted in red. The base is approx 145mm high, with a major diameter of 134mm and base rim diameter of 118mm. The item is in excellent condition and free from chips, cracks, crazing, staining and restoration". There was only one bidder who secured the piece for its opening bid of £135. 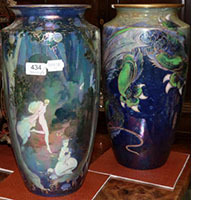 This pair of vases appeared in Catherine Southons Auction, Selsdon, Surrey on 27 February 2019. 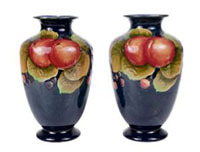 The catalogue description read "A pair of Shelley Pomegranate pattern vases, c.1928 each of balluster form, painted with a band of fruit to the shoulders against a mottled blue ground, each with incised 'Shelley' mark to the underside (2), height 23.5cm.The pair sold below estimate (£400-600) at £300 + fees. 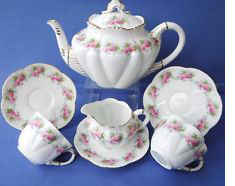 Just sold on Ebay this week was this tea for one set. 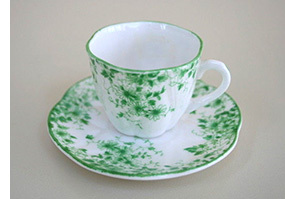 Simply described as "A tea for one set in the Maytime pattern by Shelley, all pieces in very good condition." It caught the eye of many collectors with thirty three watching the item and nine placing a total of eighteen bids between them. The highest bid which secured the set was £258.99. Almost impossible to find these days this duo belonged to an avid collector. The description read "Both pieces 'ring true'. I cannot find any flaws, chips, cracks, repairs, etc. to either piece". With a starting price of US$600.00 on Ebay, only two serious contenders entered the bidding competition placing five bids in total between them. The initial bidder set the bar at US$725.00 which, unsurpassed, became the winning bid. This rare jardiniere stand (minus its jardiniere) came up for sale in Stride & Sons' auction of antiques in Chichester on 1 February this year. Described simply as " A rare Foley Intarsio jardiniere stand painted with cranes, 73.5 cm high", no details are available regarding its condition. The bidding opened at £180.00 and the final hammer price reached £460.00 plus fees of 21.6% - a very modest price for such a rare item. Did the buyer have the matching jardiniere - if not a long search awaits! Early Wileman pieces by nature are scarce. These pieces in the pattern 'Flower Sprays' carry the J F Wileman 'diamond' registration mark. 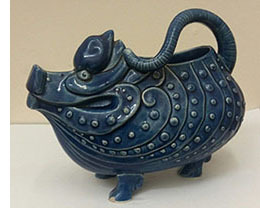 The pattern has been seen before on water sets, jugs, bowls and large meat plates, but rarely on teaware. It is not surprising therefore that when listed on Ebay last week with a 'Buy it now' option, they were quickly snapped up for just under £50.00. Condition described as "having crazing typical of earthenware, overall staining of the type that may soak out, and the sugar has a large chip to the edge of the lid and a small chip to the edge of the lid. No additional chips or cracks". The creamer measures approximately 4 3/4 inches wide from spout to handle x 4 3/4 inches tall. The sugar measures approximately 6 1/2 inches wide from handle to handle x 6 3/8 inches tall. Four cups and saucers and a bowl were also offered as additionsl lots - as yet unsold. 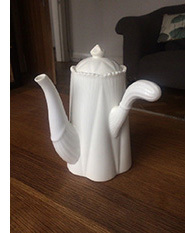 This stunning 16cm high coffee pot attracted much interest when it appeared on Ebay this week. 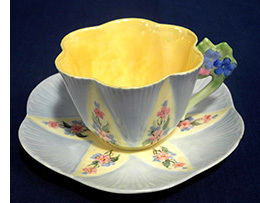 Described as "simply stunning .....wonderful and rarest of vintage Daisy shaped china .... in remarkable condition with no chips cracks or restoration ... vibrant in it's gold and blue design.." Given that description, nine bidders placed a total of twenty nine bids between them, with a final bid of £325.00 securing the item. Another rare Intarsio piece has come up for auction. 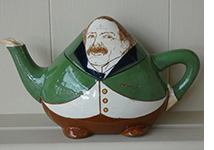 This Wileman Oriental teapot by Frederick Rhead attracted some specialist collectors to the lot which sold last night on Ebay. The description read "...rarest of vintage Fredick Rhead shaped china consisting of a stunning 17.8 cm high super shaped teapot. In remarkable condition with no cracks, chips, just a small very expert restoration to the tip of the spout .....stunning and vibrant in its hand painted Oriental Roses design dating from 1900". Six bidders fought for this piece placing fourteen bids between them, the final bid reaching £273.90. Tennants Auctioneers, Leyburn have just sold this pair of Shelley lustre cylindrical vases today in their 'Antiques and Interiors' sale. 38cm high and signed by Walter Slater, one vase decorated with Chinese dragon has large chip to rim the other vase has gilding on rim rubbed. Both vases have slight crazing to interior. The auctioneers estimate of £300-400 for the pair was quickly surpassed, the pair opening at £800.00 on commission bids and finally reaching a hammer price of £950.00 + VAT and fees. In 2017 we featured a similar plaque entitled 'Ducks in Flight' which at the time failed to sell on Ebay. This plaque we believe comes from the same seller and has just been acquired on a 'Buy it now' sale for £425.00. 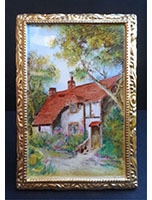 Described as "An extremely rare (never seen one before) Shelley "Cottage" hand enamelled plaque. C.1940. Hand enamelled / painted decoration on transfer depicting a woodland cottage scene. Beautiful gilt edged border (22 carat gold leaf used by Shelley). The border is very similar to the original Shelley point of sale shop signs from the same period.Condition: Excellent and clean with no chips, cracks, crazing, scratches or restoration. The gilt border has an odd tiny white spec where the gilt has rubbed through". This diminutive cup and saucer described as 'Dainty Blue?! in perfect condition just 1.13cm high and saucer 2.37cm in diameter green and white floral marked Shelley England' has just sold on Ebay for US$843.00 (£669.00). These miniatures always command a good price and this duo was no exception. Starting at $99.99, six bidders quickly placed twelve bids between them to reach this final figure. 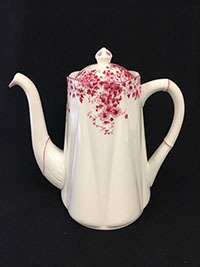 This teaset for six people, pattern No.11739, comprising milk jug , sugar basin, six cups and saucers, six side plates and two sandwich plates was on sale at Potteries Auctions on 10 November. Described as painted in red and black with simple floral band and triangular filled handles, this set quickly realised a hammer price of £950.00 + commission. Several items belonging to the late Jill Burridge, a former member of the Shelley Group, were sold at Adam Partridge Auctioneers, Macclesfield sale on 1 November 2018. Jill had a fabulous collection of mainly Wileman pieces and although there are too many to list individually on this page, a supplement has been produced which my be accessed via this link. This Art Deco stunning rare Wileman Bouquet Pink Roses, Ribbons And Bows twenty one piece tea set, has just sold on Ebay. 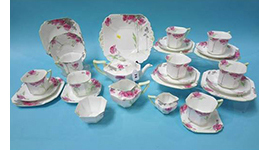 Comprising six cups, saucers and plates, plus sugar basin, bowl and cream/milk jug, all with garlands of pink roses with swags of blue ribbons tied in bows, gold handles, borders and trims, with Wileman factory marks, this set attracted huge interest. Nineteen bidders placed a total of one hundred and seven bids to reach a final sale price of £2260.00 - Wow! Sold at Bamford's Design auction on 17 October was this large china figure group by Mabel Lucie Attwell. 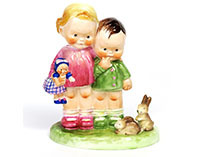 The piece entitled 'Our Pets' showed two young children, one holding a doll, watching two rabbits, was 21cm high and carried the usual factory backstamp and facsimle signature. The final hammer price was £500.00 (+25% buyers premium) which was at the lower end of the estimated sale price range. Halls Fine Art Auctioneers - Shrewsbury featured this clock in their sale on 26 September 2018. 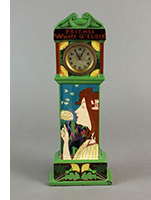 Described in the catalogue as' ..circa 1900 Art Nouveau style designed by Frederick Rhead, decorated with a woman blowing dandelions, the script reads "Prithy, What's O'Clock", printed factory marks in black and the numbers '3116' alongside Registration Number, 33.5cm high.' The the piece sold at mid-estimate for £420.00 + commission. Another Ebay auction this week involved this rare jardiniere decorated with the Moonlight pattern in shades of orange and brown. Measuring 3.5" in height and 5" square it was stated to be in 'good condition with no chips, cracks, or restoration - just a little wear to the inside paint and a small scratch to one side. Colours are strong and clear'. There were only two bidders for this piece with the winning bid being £30.99. A small sun for such a lovely item. This splendid duo came up for sale on Ebay this week. Ripon is one of Shelley's most popular blanks and this set is in a much desired beautiful black background chintz pattern number14196. Twelve bidders placed a total of thirty one bids between them with the winning bidder securing the duo with a final bid of $482.88 (£372.69). These hand painted plates by F Micklewright were listed in a sale by David Duggleby Auctioneers, Scarborough earlier this year. The set consisted of 3 plates depicting a fish, a woodcock and a quail. The fish plate was un-marked but not thought to be a Wileman piece due to the thickness of the china however the other two plates were Wileman backstamped. The set realised a sum of £120 + fees - £149.52 in total - a very reasonable price for Micklewright pieces. This trio has just sold on Ebay. Described as "a superb tea trio consisting of plate, saucer and cup in the Wileman Foley (early Shelley) Ribbons & Bows pattern, Royal Shape. The decoration shows a hand painted floral garland with raised, almost enamelled, turquoise ribbons and bows. The tea plate is 17.75cms across, the saucer 9.75cms and the cup is 5.5cms high, with a diameter of 9.75 cms.The trio is in perfect condition with no wear to the decoration, whilst the gilding to the edges is almost pristine. The plate and saucer shows the green mark showing " THE FOLEY CHINA" over a crown above the "C W" initials over "ENGLAND", plus the design no. "9656". The tea cup shows the design no. "9656" only. The trio attracted 12 bidders placing 20 bids between them, the winning bid reaching £223.00. A collection of Shelley Chintz cups and saucers in various designs including Marguerite, Countryside, Rock Garden, Melody etc came up for sale in the Potteries Auction on 14/7. 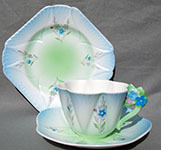 Items included three Ripon cups and saucers, three Oleander cups and saucers and an Oleader cup mis-matched with a Ripon saucer. The auctioneers estimate was £60 - £120 but active bidding pushed the final hammer price to £800.00 +fees. 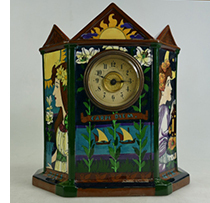 This Foley pottery 'Intarsio' clock, circa 1900, designed by Frederick Rhead, was recently auctioned. Described as having 'a cream circular chapter ring with black Arabic numerals, the case with pitched roof above canted sides, printed and painted with a bright yellow sun above three tall lilies, sailing boats and a banner inscribed 'Carpe Diem', the canted corners with half-length portraits in profile of Art Nouveau maidens above the inscription 'Dies Nox', flanked by further side panels of tall lilies, printed maker's marks and number '3160' to back of case, height 29.5cm'. The estimated sale price was £300 - £600 and the actual figure achieved on the day was £380.00 + fees. 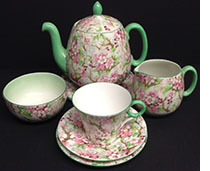 Shelley Maytime Part Tea Service - Circa 1930's - 40's. 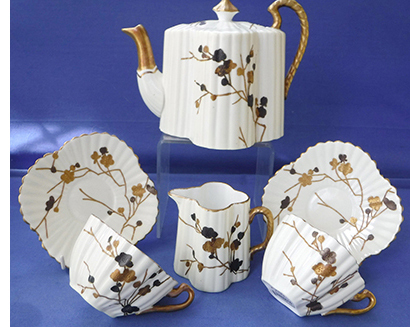 This Shelley Maytime chintz pattern part service came up for sale in the Potteries Auction on 14 July. Comprising tea pot & lid with stand, water jug & lid, milk jug, small sauce boat (small chip to rim) & saucer, small oval platter 25cm, large circular platter 35.5cm. with some pieces bearing original black labels. The original estimate of £70-140 was well exceeded on the day with a final hammer price of £280.00 + fees. This Wileman vase meassuring 5.5" in height has just sold on Ebay this week. In the Pastello pattern and marked 472 and 3548 on the base this piece was not without damage - a hairline crack to the body and a small chip on the base. Despite this the item interested four bidders who placed a toal of six bids between them. The winning bid was £421.00. 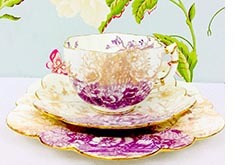 This pretty Tea for Two set attracted a lot of interest when it was listed on Ebay recently. 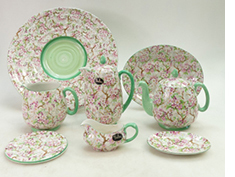 In Rose pattern the set comprised teapot, milk jug, underplate, two cups and saucers. The set captiured the attention of 55 people who watched the progress of the auction placing 37 bids between them. The set was finally secured by a winning bid of US$932.00 (£691.86) - a remarkable sum! Once again these floral handled variants of Dainty have hit the sweet spot with collectors. In two separate auctions on Ebay these two duos in rare and unusual colourways have pushed the prices ceiling higher for such pieces. The pink variant received 27 bids from 15 bidders the winning bid achieving a sale price of US$ 685.00 (£505.68). The blue piece was similarly contested receiving 25 bids from 14 bidders and a slightly lower sale price of US$668.99 (£493.13). Lyon and Turnbull (Edinburh) featured this Shelley girl advertising figure in their 'Decorative Arts: Design since 1860' auction on 11 April 2018. Described as a 'Shelley Girl Advertising Figure, Circa 1925, modelled as an elegant figure in a blue dress, green Shelley backstamp to underside, 31cm high'. After a promising initial surge, bidding slowed and the item struggled to reach it's final bid of £850.00 + fees. 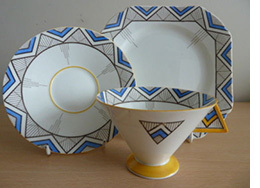 Sold this week on Ebay this stunning Vogue shaped Shelley trio decorated in the Chevrons design. 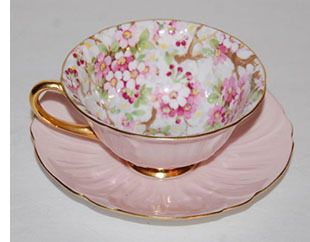 The cup is 2.5" tall and the matching saucer and plate 5.5" and 6.5" respectively. All items in good condition with no chips cracks or repairs. The ping is described as "bright and strong". Some very minor rubbing to the cup. Backstamped - 'Shelley China England'. 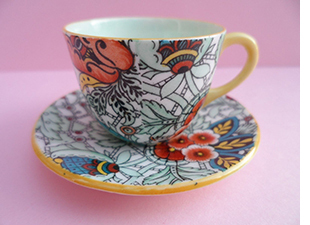 This vibrant coloured Queen Anne cup and saucer was recently listed on Ebay. Simply described as 'in excellent condition, no chips crazing or cracks, nice ping'. Backstamped F 2194, Shelley England, Rd. 723404. On sale from Australia on Ebay was this musical whisky jug. 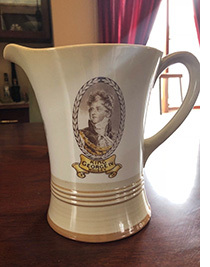 The seller described it as "a rare Shelley Musical Whisky Jug advertising King George IV whisky. 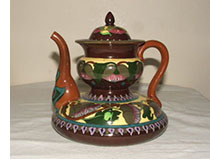 The jug stands 18cm tall and is in stunning working condition". The winning bidder secured this item for AU$ 360 (£276.14) against competition form 10 other bidders who between them placed 22 bids. 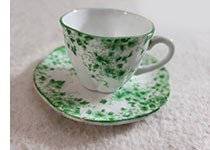 This miniature cup & saucer by Shelley in the Dainty Green pattern with green trim sold recently. In very good condition. No chips, cracks, crazing. Some light scratches to backside of saucer. Saucer measures 3" in diameter. Cup 1 3/8" high, 1 3/4" diameter at top opening. These floral handled Dainty pieces continue to attract high prices - for the right colourway. This pink duo sold on Ebay for the princely sum of £425.37 probably the highest figure seen in recent times. 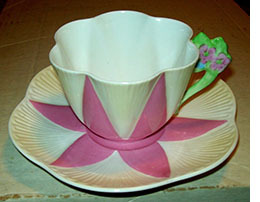 Described as "Super looking Shelley Art Deco era tea cup and saucer decorated in the pink star pattern with classic Dainty form and signed on the back SHELLEY England Rd.272101... 11993...Ryrie-Birks Ltd Toronto. 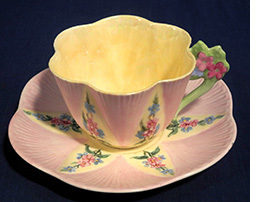 The cup measures 2.75" tall x 4.5" rim to handle while saucer is 5.75" wide. Set is in excellent clean sound original condition with absolutely no chips, damage loss or repairs. Pings with resonance.....Guaranteed old and authentic." What more could you want? Thomas Watson Auctioneers - Darlington, featured this lot in their Fine Art auction on 27 Febrary. 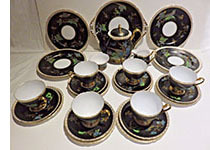 Described as 'a rare Shelley Mode tea service in the Butterfly Wing pattern No. 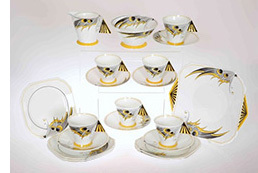 11758 comprising six cups and saucers,, six tea plates, cream jug, sugar bowl and sandwich plate. A sale price of £1300.00 (+ 24% buyers premium) was realised - short of the pre-sale estimate of £1500 - £2500. Just sold on Ebay this colourful Daisy shape trio was watched by almost 70 potential bidders. Carrying registration marks 115510 and 160786 the gilding was said to be in very good condition, minor crazing to the side plate, but although no visible trace of hairline to the cup, it lacked the customary ping. 16 bidders placed 20 bids between them, the final bid of £77.00 securing the item. 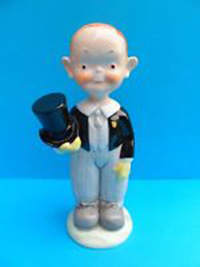 This MLA figure was offered for sale in Tennants Auction in Leyburn on 26 January. 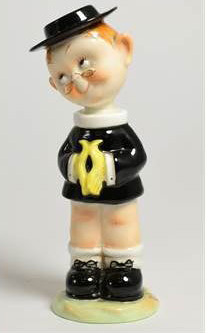 Described as "A Shelley Mabel Lucie Attwell The Curate Figure, printed factory marks and THE CURATE L.A.4 Copyright 17cm. Paint nick on shoe. Firing blemishes in the black painted areas. Air bubbles. 151117." 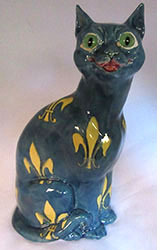 This cute figure sold for £70.00 plus commission - a very low price. These 5 items of Wileman Intarsio nos. 3543, 3336, 3028, 3020, &3023 were sold as a single lot at Chiswick Auctions on 23 January. A total sale price of £900.00 + 25% commission was achieved. No description available. 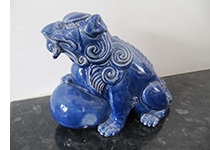 These 3 early Faience items went under the hammer at Chiswick Auctions on 23 January as a single lot realising a sale price of £480.00 + 25% commission. 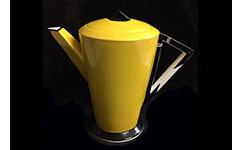 This 1930's yellow Dainty porcelain part coffee service, pattern 11993, comprising coffee pot, cream jug, sugar bowl, six cups and saucers was sold for £1100.00 by Golding Young and Meyer in their January Antiques, Fine Art, Silver and Jewellery Auction this month. With an initial estimate of £200 - 300 this item quickly surpassed expectations. 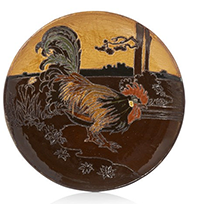 This Foley Faience wall plate by Frederick Rhead featured in Roseberys auction this week. The description read "Frederick Rhead, a Foley Faience glazed ceramic wall plate. Printed factory marks, incised 11066A Incised with a cockerel in a ladscape grazing. 30.5cm diameter. Some chips to the glaze on the edges. Some light crazing to the glaze. Some scratches and wear to the reverse." The successful bidder secured this lot for £220.00 + fees. 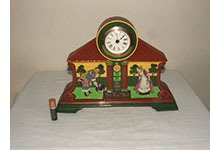 This item, although rare, has been found previously as a desk clock. 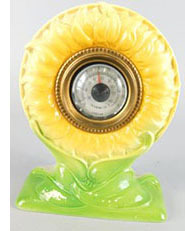 Golding Young and Mawer described it as "A Foley Faience desk thermometer, the case modelled in the form of a sunflower, printed mark in brown to underside, 16cm high." It achieved a sale price of £260.00 in their Lincoln Collective Sale in January. 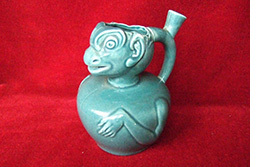 Sold on Ebay this week is this unusual green 'Grotesque' jug. Simply described by the seller as "A rare antique Foley Wileman & Co Grotesque jug circa 1900 standing approx 15cm high. It is in good condition with no chips cracks or restoration." Eight bidders placed a total of seventeen bids with the item finally being secured for the sum of £878.05 . 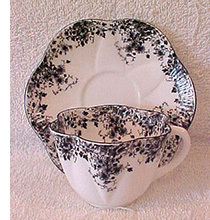 Shelley Dainty Black cup and saucer. 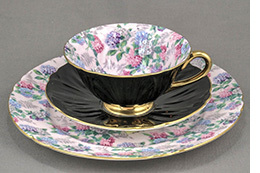 Continuing the 'black' theme, this cup and saucer has just sold on Ebay for $745.00 (£550.57). The seller described the duo as "a rare Shelley china dainty black cup & saucer in excellent condition. No chips or cracks. 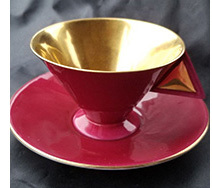 The cup measures 2 1/2" tall and the saucer measures 5 1/4" in diameter. 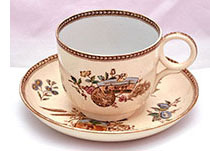 Both the cup and saucer have the Shelley logo mark on the base. Black is a very scarce color in the dainty line." 10 bidders were attracted to this item. 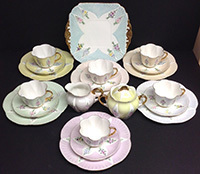 Another interesting Ebay lot described as a " 1939 Shelley luncheon set for six people - luncheon plate, side plate, cup and saucer, teapot, sugar, creamer and cake plate..28 pieces in all. Pattern No.13550 Black with green and blue painted birds on the pieces except the saucers and the side plates...bird flowers gold gree and blue hand painting. Pre owned but a cabinet piece - in very good condition/ no chips or cracks". 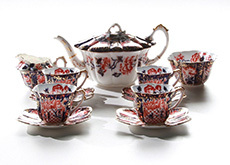 Just 3 bidders for this wonderful set but achieved a sale price of £734.50. A number of items belonging to the late Jack Heron, former decorating manager at Shelley, went under the hammer at Hawleys Auctioneers, Beverley on 19 November 2017. There are too many items to list on this page but click on this link for a selection of the more interesting lots. 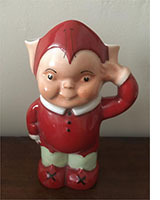 Grotesque items such as this rarely appear on Ebay. Described as an animal figure measuring five and three quarters of an inch in height, six and a half inches in length, three inches wide, in good condition with two chips to the front legs, a very small chip to the rear leg and a tiny chip underneath the base to one leg, minor age related wear. Eight bidders contested this great item placing a total of fourteen bids between them. The final winning bid came in at £830.50, just eight seconds before the end of the auction. This very unusual piece of Intarsio has just sold on Ebay. It has an ivory face of an Egyptian man with the body of a duck with three legs. Said to be in great condition with no damage it is 5 1/2" in height and 6" across. With a starting price of $950.00 (£719.21) the item attracted just one bidder who paid the starting price. A great item for someone's collection. Shelley Mabel Lucie Attwell "The Bridegroom" LA6 figurine. C.1937. This Ebay auction was for an early Wileman pre-Shelley tea for two set - cream background decorated with gold & silver flowers on Alexandra shape. The overall condition was stated as very good with no damages,no chips or repairs. "It has been well cared for and does not show any signs of use. The pieces ring well when lightly tapped and show no glaze crazing to the eye, it may be visible under magnification, [considering the age] Gilding in good order,teapot internally clean and un-stained. Only very minor point to mention, there is a small firing flaw on the underside of the teapot". In all 32 bids were placed between 7 bidders and the winning bid was £431.00. 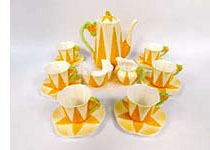 A Princess shaped tea-set with teapot, pattern number 12226 came up for auction at Boldon Auctions, Tyne & Wear today. It had an estimate of £200 - £400, and sold for the remarkable sum of £3,500. Whilst the Princess shape is unusual, a bid of this magnitude is usually anticipated for example with a similar Vogue set. 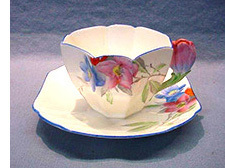 An unusual pattern 11995 in the floral handled Dainty series this blue and pink floral handled trio with pale blue and graduated wash attracted 13 bids from 5 separate bidders on Ebay with a final bid of £321.11 securing the purchase. The Pattern Books show this pattern recorded as introduced in 1932 and consistent with this the trio has the 'Shelley England' backstamp. The item was said to be in "excellent condition, each piece ringing clearly and thus confirming the presence of no hidden hairlines; certainly no chips or cracks nor any scratching, fading, rubbing, crazing, discolouration, etc., and no restoration." 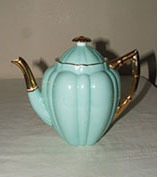 This Shelley Vogue coffee pot sold on the second time around on Ebay. 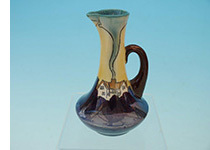 Originally (inadvertantly) described as " A stunning Shelley Vogue small jug from coffee set. In excellent condition with no damage or restoration" it was offered for sale with a 'Buy it Now' price of £795.00 although a lower unknown price appears to have been accepted. A great purchase for someone. Described as "...this wonderful & rarest of Vintage Arts & Crafts china consisting of a 22.5cm high footed twin handled vase.And in remarkable condition with no cracks , chips or restoration .And in the stunning & vibrant Shakespeare Much A Do About Nothing Federick Rhead design dating from 1903", this vase sold on Ebay for £167.00 plus postage. 4 bidders hotly contested for the piece placing 13 bids between them. These rarely seen and lovely Art Nouveau wall plaques by Fredrick Rhead have just sold separately on Ebay. Each measuring 30 cm in diameter, and bearing the Faience backstamp, plaque (1) attracted 6 bids and was secured by a final bid of £155.55 and plaque (2) attracted 2 bids and sold for £142.00 + £12.00 in each case. Modest amounts considering their rarity. On a second listing on Ebay this item attracted a single bidder and sold for £175.00. Described as " A most attractive Early 20th Century Vintage Shelley English Porcelain Vase by leading designer Walter Slater, decorated with a fish swimming amongst waterweed, the sparkling irridescent pale green lustre heightened with gilding. The underside of the base with printed Maker's Mark in gilt and facsimile signature "Walter Slater" in black script. Height ~ 18cm Year ~ Circa 1920. Excellent condition". 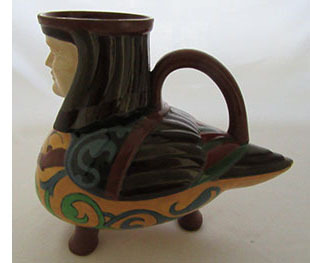 This rare Wileman & Co."Urbato " earthenware shaving mug/ toothbrush holder from between 1894 - 1910 has just sold on Ebay. Described as "This attractive English pottery stands approximately 6" high and has a wonderful arts and craft sqeeze bag design. The bottom is numbered " A 7059". There is minor crazing along with small bits of finish loss and a chip at the base which is all forgivable considering the rarity of the pattern". Despite its rarity it only attracted one bidder and was secured for a price of C$99.00 (approx £56.00) + postage.